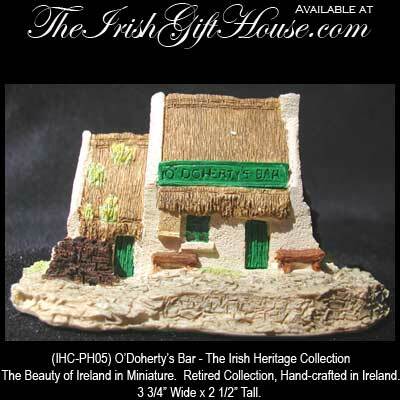 Collector’s Item - "O’Doherty’s Bar" was Originally Introduced in 1987. The Beauty of Ireland in Miniature. Retired Collection, Hand-crafted in Ireland. 3 3/4” Wide x 2 1/2” Tall. This is a good example of a traditional Irish bar, which can be found in many villages throughout Co. Donegal. This bar, with its thatched roof, whitewashed walls and homely interior, makes a welcome retreat for the weary traveler.